Grants Available for Revitalization and New Church Start Projects! Funding Grants are available through the annual conference for Church Revitalization and New Church Development projects. The Conference Vitality Team meets in the fall and spring to review proposals for funding. 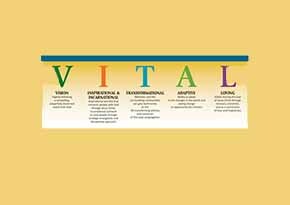 What is a Vital Church? 5. Loving God and loving others as the most tangible signs of life and faith. Grants will be considered for existing churches that demonstrate a strong commitment toward greater vitality in outreach initiatives, new worship service development to reach new, younger and more diverse population groups and social justice work. Matching grants will be given the greatest consideration for funding. What is a New Church Start? NOTE: There are many effective strategies our existing churches can use to reach new people (new worship services, Bible studies, outreach ministries, small groups and etc.,) but these, though important, may not necessarily be considered as new church plants. Grants will be considered for new church development projects that demonstrate a strong commitment toward partnership with other ministry and granting agencies, development to reach new, younger and more diverse population groups and social justice work. Matching grants will be given the greatest consideration for funding.